IKEA Trådfri can now be Flic'ed! Today we are proud to give you support for IKEA Trådfri connected lighting series. 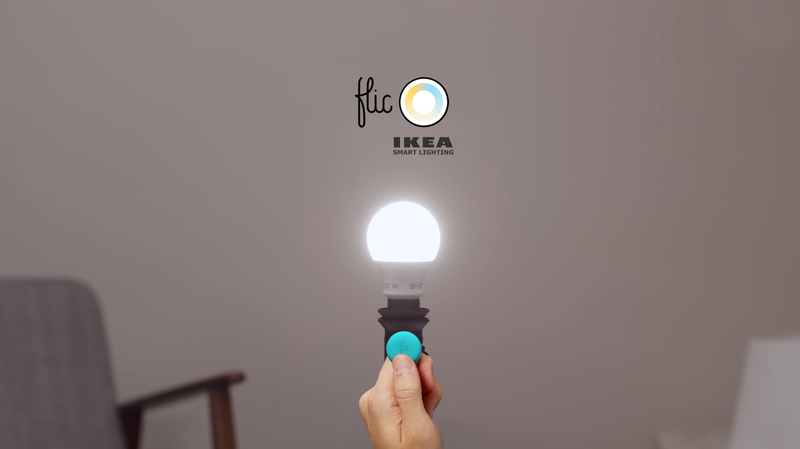 Use Flic or Flic Lights to quickly turn the IKEA lights on or off, change the color temperature, or dim them to a favorite preset. Buy Flic and Flic Lights here. IKEA made a big splash in the Home Automation scene a few weeks ago as they released a whole series of connected lights and accessories. IKEA is now competing directly with Philips Hue, LIFX, Osram Lightify and a few more, but have an advantage in a true-to-brand low pricing and an incredible worldwide distribution. The quality of the Trådfri bulbs is being praised in reviews, and although they may not have the rich feature set of Hue and LIFX, the value for money is very high. To connect your Flic to IKEA, the Trådfri Gateway is required. Flic is, as usual, connected via Bluetooth Low Energy to your phone or Mac. The Flic App in your device then connects to the Trådfri Gateway via LAN, which in turn controls all the different Trådfri light bulbs individually. It may sound complicated, but we managed to do it as simple as always, and with a next-to-nothing delay. Try it out for yourself, clicking Flic to turn your lights on will be as quick as hitting a regular wall switch. The Flic Hub is coming out soon and will make Flic able to control Trådfri (as well as everything else) without the need of a connected phone or Mac. We tried to find any other system that was compatible withTrådfri but so far it looks like no one else succeeded. We’re proud to get this working this quickly, proud to be first to do it, and proud to (finally!) be able to collaborate with the fellow Swedish behemoth.